I purchased my Yumi Kim floral printed dress about a year ago in New York and have been saving it for the perfect hot as hell weather to wear it. 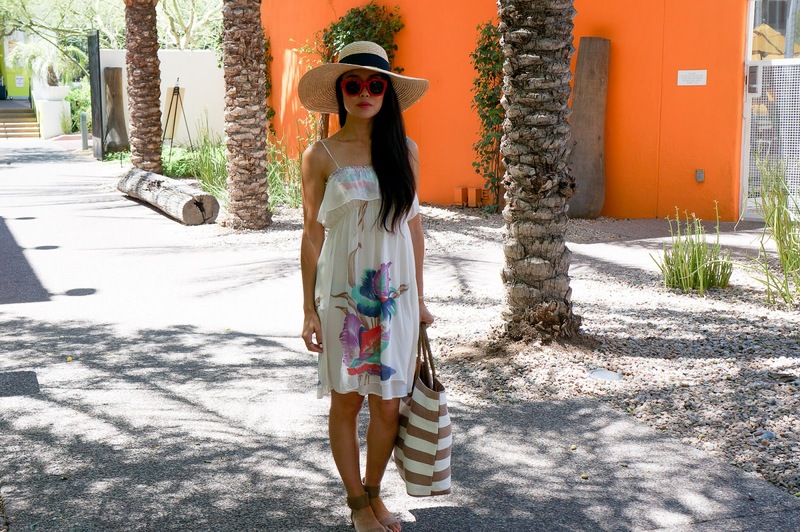 So of course it made its grand debut in Arizona where by happenstance the print matched the vibrant colors of The Saguaro Scottsdale, a Joie de Vivre hotel. Although I try to incorporate prints into my work and weekend outfits, when I'm on vacation, I get a little carried away and end up bringing nothing but prints and bold colors. I guess it's my way of wearing a Hawaiian shirt without actually wearing one. In the process of putting together this post, I did a little window shopping online and found a few more absolutely perfectly Yumi Kim vacation prints so that no matter where you are or what you're doing, you're just a dress away from being in a vacation state of mind.